Gastroesophageal reflux disease (GERD), commonly known as acid reflux, is a digestive disease that affects more than 60 million Americans. Statistically, 1 of 5 people suffer - GERD can happen at any age: infancy to old age! These detrimental changes can lead to Barrett’s Esophagus (inflammation/irritation of the esophagus), the precursor to formation of cancerous tumors in the esophagus. Though uncommon, its scary stuff. So, how does one know if their esophageal sphincter (which, separates the stomach from the esophagus) isn’t working properly (i.e. it is causing acid to seep out of your stomach) before they experience warning signs (regurgitation and heartburn) of GERD? If you’re curious to know at this very moment, feel free to take this self-screening survey. But, if you visit your dentist, he or she can certainly tell! Dental professionals are skilled at looking for oral signs of GERD and oral cancer. 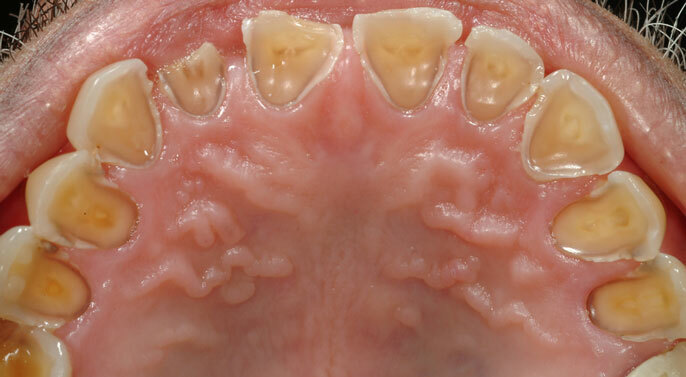 There are subtle ways we can assess if your teeth are slowly deteriorating; they present as erosive patterns (enamel damage, dents on the chewing surfaces, etc.) on your molars or on the backsides of your teeth (the sides that touch your tongue). You may also realize that your teeth are more transparent than normal, begin to see cracks on the edges of your teeth, or you notice that your teeth look 'worn out'. That’s why getting a regular oral exam from a dentist is so important — we can identify dental erosion and early symptoms of a potentially serious problem before it progresses. In fact, more than 90% of systemic diseases have oral manifestations that may be detected during an oral exam by a dentist. If the high levels of acid in everyday foods and drinks can be harmful, just imagine how much damage can be caused when stomach acid comes in contact with your teeth! Stomach acid has way more power to erode your teeth… and when the outer layer of your teeth (your enamel, the protective surface) wears away, it makes your teeth more vulnerable to plaque and bacteria -- resulting in decay, sensitivity and discoloring. 2. Resist eating 2-3 hours before bed. 3. Avoid triggers like smoking, alcohol, coffee, or acidic drinks. 5. Lose weight - it can go a long way in reducing GERD. Keep in mind, when you have an episode of GERD symptoms, you may be tempted to brush your teeth right away. But, you should wait at least half an hour to brush because the acid softens your enamel and the bristles can damage your enamel. Instead, rinse vigorously with tap water and floss to reduce the acid in your mouth. You should also add fluoride rinses (ACT) to your home care routine! Though most people see their doctor to be are medicated to control these episodes, the medications have serious long-term consequences: malabsorption of key minerals in the body such as calcium and magnesium (osteoporosis, seizures, arrythymias, hypotension, etc.) AND increased risk of infections (C. difficile and pneumonia). Try your best to use these medications for the short-term. Sadly, erosion is permanent. But, as your dentist, we’re here to help you restore what has been damaged. The best way to prevent GERD is to understand the root causes: your diet and lifestyle. If you suffer from GERD, an eating disorder, or a related condition, seek professional help! Hope this was helpful!